Sonic Concept to launch 'Modern British Audio Company' hi-fi brand | What Hi-Fi? 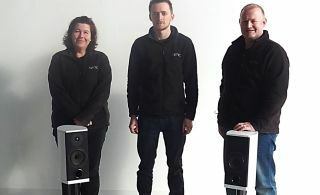 A new UK hi-fi brand will be taking its bow at the Bristol Show this weekend, with Sonic Concept set to unveil its first range of loudspeakers and electronics under the Modern British Audio Company banner. The business has been in existence since May last year after managing director Darren Hollands acquired the assets of UK manufacturer O’hEocha – now we can see the fruits of its labour. A small team has been working on taking O’hEocha's existing products "to the next level" and the original O’hEocha D1 range - a standmount, floorstander and a centre - is the first to undergo development and improvement. As a result, Sonic Concept has confirmed that stand-mount and floorstanding models will receive a first outing at Bristol – with further models planned for introduction over the coming months. All the design and manufacturing work is expected to be carried out at the company's HQ in Kent, while it's also hoping to source as many components as possible from fellow UK companies. The company is also unveiling the first in a planned range of electronics – an integrated amplifier and DAC, features of which will include the option of built-in phono or digital stages. Hollands said: "We are a close-knit team of people all focused on making the best performing and fabricated products we can and bringing them to the attention of the traditional audiophile market, but also to those people who want a piece of desirable modern equipment in their homes. "Given the huge interest in music playback, the vinyl comeback, interest in high-res audio and ever more design aware consumers, we know we will have something of interest when we launch."